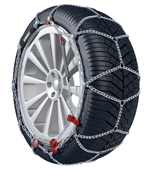 Thule/Konig K-Summit Snow Chain - The smartest solution from Thule/Konig. Thule/Konig CK-7 Snow Chain - Micro fitting chain for minimum clearance. Depending on the vehicle and tyre size there are three models in the Thule/Konig K-Summit family to choose from. The standard Thule K-Summit is for most passenger cars. The Thule/Konig K-Summit XL is for crossovers and small SUVs up to 2000 Kg unladen weight and the Thule/Konig K-Summit XXL version for larger SUVs over 2000 Kg. Thule/Konig Easy-fit snow chains has been awarded the prestigious innovation of the year award at this year's EquipAuto fair in Paris, France. The award is given to Thule/Konig Easy-Fit for its groundbreaking technology making the fitting of the snow chain easy as never before. The motivation to the award is a proof for the Thule Group once again being in the forefront when it comes to innovation and product development. The name says it all: "THULE/Konig Easy-fit" brings the traditional passenger cars snow chains standard to the next level, with a huge step towards the easiness for the end consumer. "THULE/Konig Easy-fit" is a true innovation both from a technical and a design perspective. - We are very proud to receive the EquipAuto Innovation Of The Year Award says Alberto Guidotti, Business Unit Director Thule Group Snow Chains and continues. It is a testament to our ambition to be at the forefront of innovation and simplicity for the user and we are confident that Thule/Konig Easy-Fit will strengthen Thule's position in the market for snow chains for passenger cars. Key in the innovation is the new aluminium central bar on the snow chain. 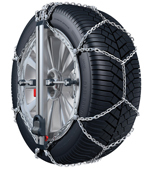 This makes the mounting of the snow chain has never been so easy, intuitive and quick. Remember – One stop only: fit the chains and go. 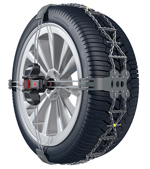 Why "THULE/Konig Easy-fit" is so "Easy and Intuitive"
The Thule/Konig CK-7 has been designed specifically to fit vehicles where, a lack of clearance between the tyre and the car’s bodywork or suspension etc., would normally make it impossible to fit regular snow chains. The maximum projection over the entire tyre surface is just an amazingly low 7mm. The chain section comprises of a special twisted link construction, which enables the thickness to be reduced to 7 mm. The special design of the chain configuration ensures that each single link comes into contact with the snow, thus increasing grip and traction. Anti scratch protectors are incorporated around the outside tyre wall to protect alloy wheels.